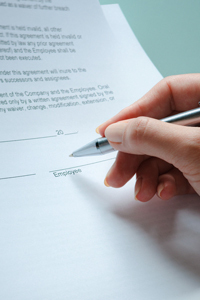 ALLOW OUR EMPLOYMENT LAW ATTORNEYS DRAFT OR REVIEW YOUR MINNESOTA INDEPENDENT CONTRACTOR AGREEMENT. Trepanier MacGillis Battina P.A. represents employers, employees, and independent contractor consultants in labor and employment matters in Minnesota. We can help you prepare or review your independent contractor agreement, assignment of inventions agreement, consulting agreement, non-compete agreement, confidentiality agreement, or sales representative agreement. TMB also handles breach of contract lawsuits when either the employer or contractor has violated an existing independent contractor agreement. It is important for employers to have an accurate understanding of their independent contractor agreement. Because the misclassification of persons as independent contractors can result in unintended liabilities to a business, conferring with an employment attorney prior to executing an independent contractor agreement is always recommended. Before entering into an independent contractor agreement, take advantage of our initial legal consultation with one of the employment law attorneys of Trepanier MacGillis Battina P.A. We offer a two (2) hour customized legal consultation for the flat fee of $500. Click here to review the terms and conditions of our Initial Legal Consultation Policy. Please call us now or complete the contact form below to learn how we can help you draft, review, or pursue legal claims regarding your Minnesota independent contractor agreement. We look forward to the possibility of representing you.